Posted: Fri Apr 10, 2015 12:28 pm Post subject: Re: TriggerHappyGamers Events! ok sure thing winthof thanks for the heads up! Posted: Fri Apr 10, 2015 4:29 pm Post subject: Re: TriggerHappyGamers Events! So far we have 9 names down for tonight! Its 6v6 and need 3 others if possible, ill ask on #1 tonight if we have not gathered the full 12 before we start at 8pm! Posted: Fri Apr 10, 2015 6:05 pm Post subject: Re: TriggerHappyGamers Events! Posted: Fri Apr 10, 2015 8:56 pm Post subject: Re: TriggerHappyGamers Events! Posted: Fri Apr 10, 2015 8:58 pm Post subject: Re: TriggerHappyGamers Events! Posted: Fri Apr 10, 2015 9:57 pm Post subject: Re: TriggerHappyGamers Events! Posted: Fri Apr 10, 2015 11:39 pm Post subject: Re: TriggerHappyGamers Events! Glad you got the numbers and had a good time, sorry I missed it! I'm away on holiday now for a couple of weeks, will hope to join a future event once I'm back! See you all soon, have fun! 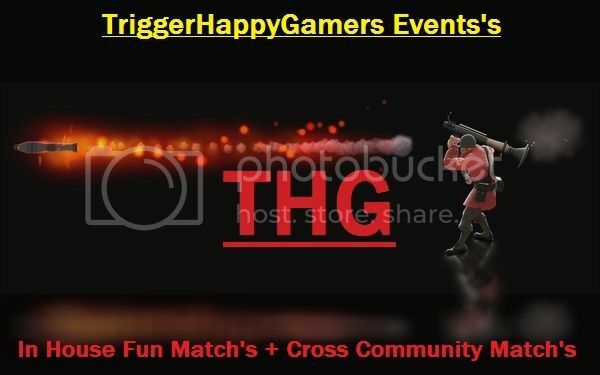 Posted: Sat Apr 11, 2015 2:12 am Post subject: Re: TriggerHappyGamers Events! Great games everyone, thanks again to Mig and everyone involved! Posted: Sat Apr 11, 2015 12:03 pm Post subject: Re: TriggerHappyGamers Events! I wasn't able to make it due to my own stupidity for not being able to figure out the time differences. Posted: Sat Apr 11, 2015 12:11 pm Post subject: Re: TriggerHappyGamers Events! Just ask Josh, he'll keep you right! Posted: Sat Apr 11, 2015 5:39 pm Post subject: Re: TriggerHappyGamers Events! That was great fun, let's do more! Posted: Sat Apr 11, 2015 6:33 pm Post subject: Re: TriggerHappyGamers Events! Posted: Sat Apr 11, 2015 9:52 pm Post subject: Re: TriggerHappyGamers Events! Posted: Sun Apr 12, 2015 1:39 am Post subject: Re: TriggerHappyGamers Events! Figured it out already so it shouldn't happen anymore. I will poke him with a stick just in case though. Posted: Sun Apr 12, 2015 12:12 pm Post subject: Re: TriggerHappyGamers Events! Better to be on the safe side.